In 1828, this casual-wear stole was woven of finest Bengal cotton and exported to Dresden, Germany, where it was embroidered in motifs to suit the European market. The cloth is like the light vapours of dawn. Muslin, he said, was the name of a legendary cloth made of cotton, fit for emperors, which used to be made way back in the past. Muslin from Dacca had been the finest, he said, from where it used to be shipped to the far corners of the world. Pakistan from 1947 to 1971 consisted of two parts geographically separated by 1,500 kilometers. At one side of the Indian subcontinent, bordering Burma, was East Pakistan, which became Bangladesh. On the other side, bordering Afghanistan and Iran, was West Pakistan, which became present-day Pakistan. We were Bengalis from East Pakistan, whose capital was Dacca, which is now spelled Dhaka. It was then a provincial town in which rickshaws plied quiet streets beneath a modest skyline. Its old quarter by the river Buriganga was a maze of lanes, redolent with Nawabi-style cooking. Life was slow. A major outing for the family was going either to one of the two Chinese restaurants or to a movie at one of the four cinema halls. To be told now that it had been world-famous for a kind of cotton cloth was a bit of a shock. But muslin, my father said, was no more. A pause. Then he added, “They say the British cut off the thumbs of the weavers so that they couldn’t make muslin anymore.” And with that, he got up from his chair and walked away. Generations of Bengali girls and boys have grown up with this legend, largely apocryphal, but in its arc and symbolism, an indelible metaphor. The story of muslin is one of contrasts and opposites: of artistry and murder, of splendor and penury, of loss and memory. 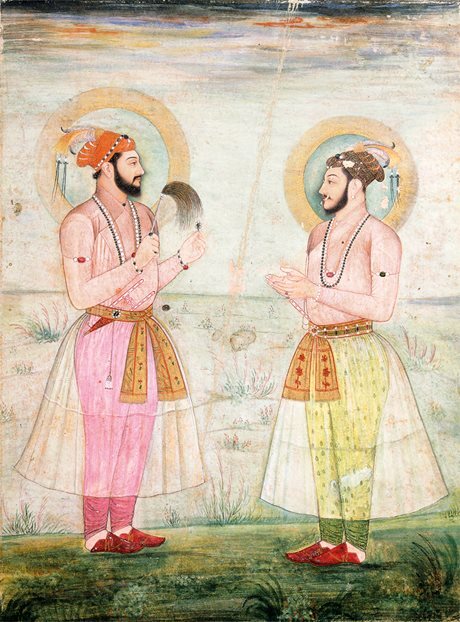 By the 17th century, Bengali muslin was associated with the power and elegance of the Mughal court in India, as shown in this 1665 depiction of princes Dara Shikoh and Sulaiman Shikoh Nimbate. 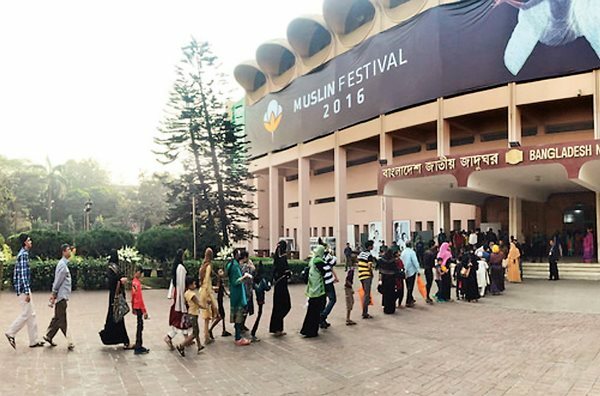 MUSLIN FESTIVAL 2016 was held in Dhaka from February 6 to 8, with seminars, workshops, the launch of the comprehensive book, Muslin: Our Story, and a preview of a documentary video, “Legend of the Loom.” An evening program on the grounds of the old mansion of the Dhaka nawabs featured a sound and light show, a dance drama and a runway of models in saris of contemporary muslin. The centerpiece of the festival was the exhibition “Muslin Revival,” held throughout the month of February at the National Museum. 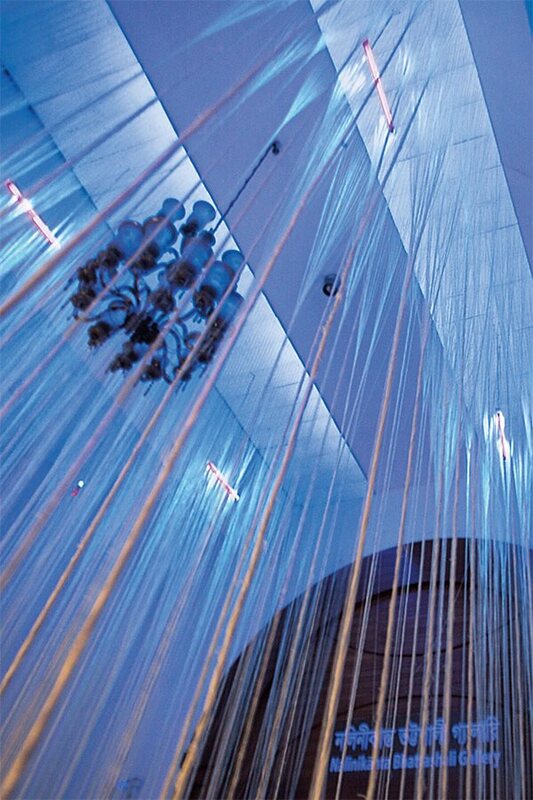 At the entrance to the exhibition, I walked into a long, narrow space with hundreds of cotton threads—thin at the top and swelling to thicker dimensions at the bottom—suspended from the high ceiling, blown by fans. Twirling and spinning in the dark air, their motion replicated the action of cotton yarn being soaked in the flowing waters of Bengal’s rivers. Muslin today has come to mean almost any lightweight, gauzy, mostly inexpensive, machine-milled cotton cloth. The word has lost all connection to the handwoven fabric that once came exclusively from Bengal. Cotton, stated the historian Fernand Braudel, was first used by the ancient civilizations on the Indus, while the art of weaving itself has been traced back to much earlier times. 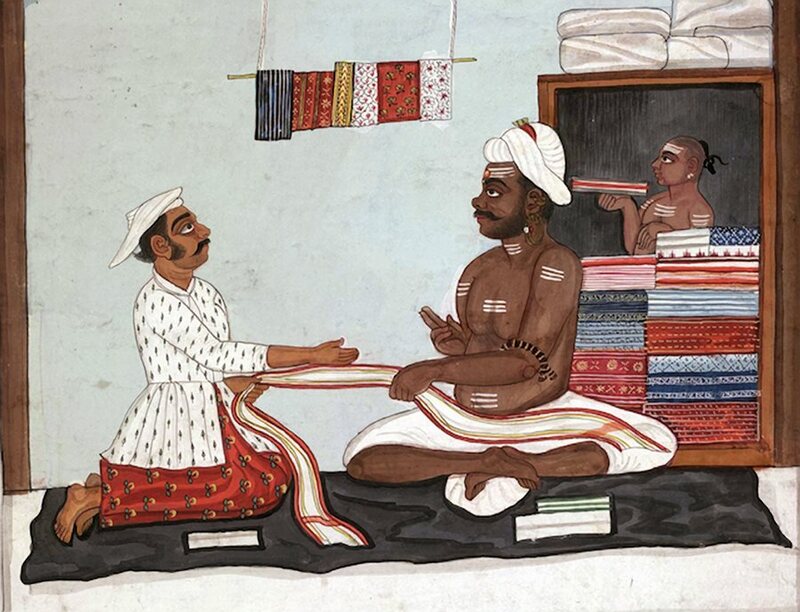 This head start perhaps was why ancient India became proficient in making cotton textiles. They became a staple export commodity to the Roman Empire, and they expanded in volume in the Middle Ages with the growth of the “maritime Silk Road” in the Indian Ocean. Arab merchants came to dominate the Indian Ocean trade from the eighth century onward, when considerable volumes of Bengal’s cotton textiles began to reach Basra and Baghdad, as well as Makkah via Hajj pilgrims. To the east, it went to Java and China, where in the early 14th century the traveler Ibn Battuta wrote that it was highly prized. He noted that among the presents sent by the Delhi Sultan Muhammad ibn Tughluq to the Yuan emperor in China were 100 pieces each of five varieties of cloth: Four were from Bengal, named by Ibn Battuta as bayrami, salahiyya, shirinbaf and shanbaf. Thriving only along riverbanks near Dhaka and to its south, Gossypium arboreum var. neglecta, known locally as phuti karpas, was spun to create threads that maintained tensile strength at counts higher than any other cotton species. 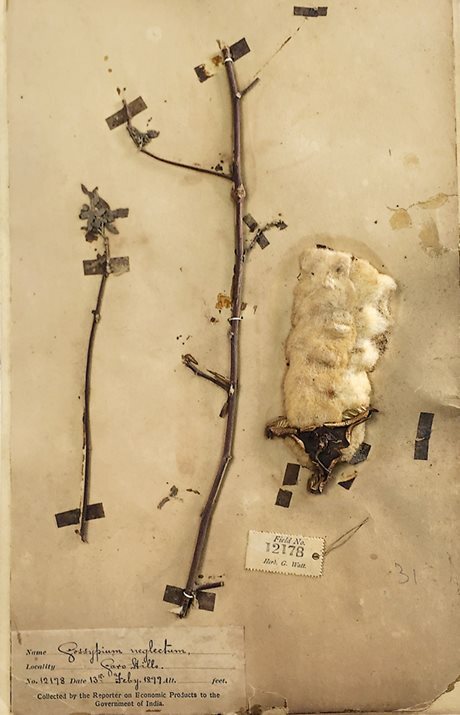 But phuti karpas defied transplanting to other locations, and British colonial policy eliminated it: Although cultivars may remain, they are unconfirmed. This sample is preserved in Kolkata, India. So what made it so special, so translucent, so softly gossamer? How did Dhaka—and only Dhaka—produce this finest of muslin? This question lay at the heart of the exhibition. Wall-mounted videos showed each step of this lost art, from the sloping riverbanks where cotton plants flourished to the final bales of muslin ready for shipping. The waters of the great Meghna river sloshed on speakers and heaved on a huge screen as a background refrain to a display of manuscripts, documents, photos and illustrations, books and coins, tools of the trade—including a startlingly fine-toothed boalee (catfish) jawbone that even now seemingly strained to catch debris from raw cotton—Gandhian spinning wheels, a rough-hewn country boat, a full-sized handloom and a series of muslin dresses scrupulously recreated from famous collections. All attempts—and there were many—to grow it outside that one natural habitat failed. Its fibers were the silkiest of all. Contrary to all cotton logic, when soaked in the Meghna’s waters they shrank instead of swelling and dissolving. Alternate sections of its ribbon-like structure flattened and actually became stronger so that even the ultra-thin thread spun from it could withstand the stress when wound in the frame of the loom. 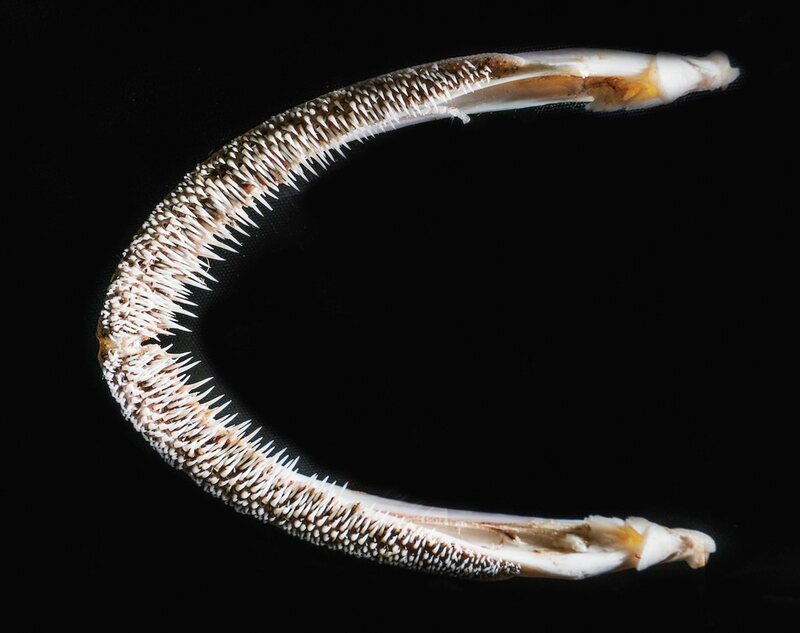 Lined with countless fine, razor-sharp teeth, the upper jaw of a boalee (catfish) was used for combing karpas (raw cotton) to clean it before ginning and spinning. 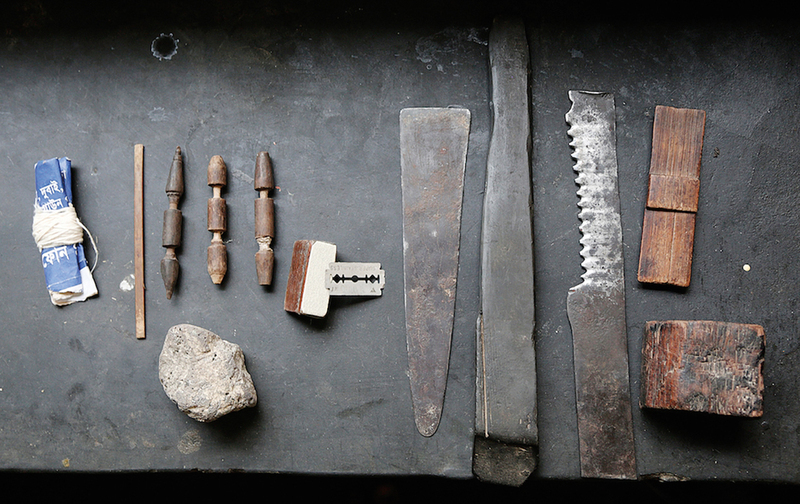 A few of the more than 50 tools used by specialists to make the muslin weaver’s shana (ultrafine-toothed reed comb) from a dense bamboo called mahal that allows for the setting of more than 1,000 teeth per meter. On a loom, shanas keep separation among spiderweb-thin warp threads. Fourth-generation cotton farmer Mohammad Nasim, of Gazipur, Bangladesh. 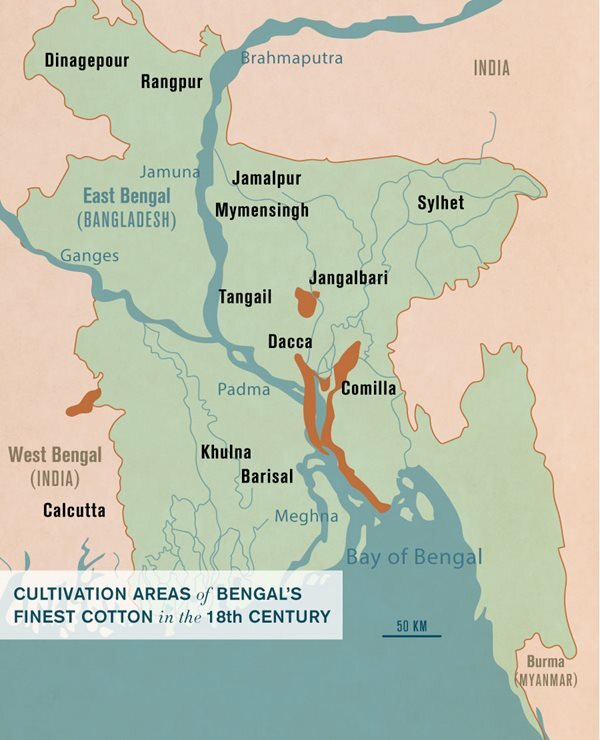 Although Bangladesh is today a major exporter of ready-made cotton clothing, since the colonial era it has imported all but a fraction of the industry’s cotton. This thread was spun in intensely humid conditions, usually in the morning and evening, and then only by young women, whose supple fingers worked with water bowls around them to moisten the air, or else beside riverbanks or on moored boats. They often sang as they spun, and if the river was shrouded in fog, passing travelers brought back tales of muslin being made by mermaids singing in the mist. Even the seeds for the next planting season were specially treated to keep them ready to germinate. After being carefully selected and dried in the sun, they were put in an earthen pot in which ghee (clarified butter) had been kept. Its mouth was sealed airtight, then it was hung from the ceiling of the hut at the height of an average individual over the kitchen fire to keep it moderately warm. The most delicate, the very lightest of fibers were spun into muslin thread, and this was obtained by using a dhunkar, a bamboo bow tautly strung with catgut. The special bow for muslin cotton was small, and only women did the work—presumably because a light touch was needed. When it was strummed (dhun also means a light raga in classical Indian music) in a distinctive way, the lightest fleece from the cotton pile separated from the heavier fibers and rose into the air. One theory is that the strumming, by vibrating the air over the cotton pile, reduced its pressure enough to allow the very lightest fibers to be pulled upward. It was these finest of fibers—a mere eight percent of the total cotton harvest—that went into the making of the finest muslin. Indeed, Dhaka muslin was woven out of air. It was late in the afternoon when I left the museum and hopped on a rickshaw to head home. All around me cars, buses, vans, auto-rickshaws and motorbikes screeched, squealed and caterwauled. Crowds jammed the pavements, spilling on to the streets. Beggars implored; urchins scurried. Dhaka by any measure is the most crowded city in the world, a metropolis lightyears removed from the small town I had known when I first heard of muslin as a boy. It seemed unreal that this was the place that had once produced that fabled fabric. It seemed even more improbable still that it would do so ever again. Mughal emperors wore dresses made of Dhaka muslin, and this became another crucial signifier of its quality. In the Mughal scheme of things, all authority and power was vested in the emperor, who manifested a God-given “radiance.” The display of pomp and the magnificence of the imperial lifestyle, therefore, was not merely personal gratification as much as it was political expression, an essential display of the empire’s grandeur. 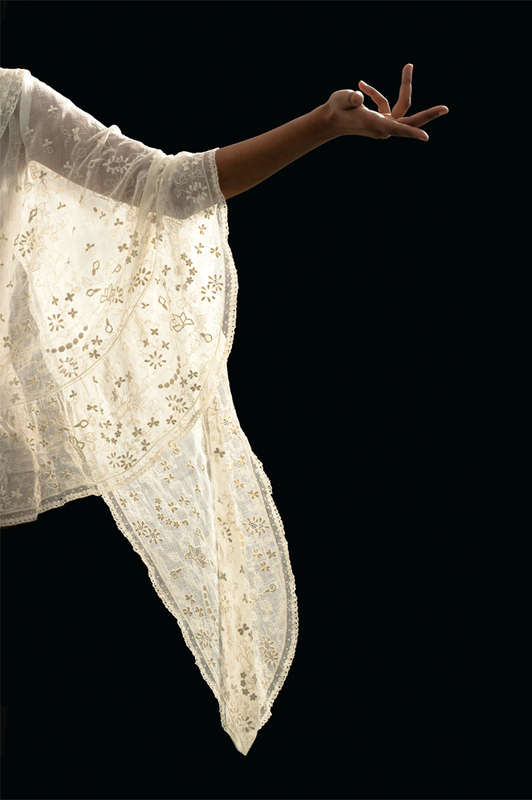 Muslin, by being worn by the emperor, became a part of the Mughal apparatus of power. Few dynasties in the world have had the artistic sensibilities of the Mughal emperors, which they displayed in remarkably integrated forms of architecture, literature, gardens, painting, calligraphy, vast imperial libraries, public ceremonies and carpets. The Mughals often embellished their muslin-wear with Persian-derived motifs called buti and embroidery known as chikankari. More crucially, they incorporated it within their aesthetic framework, giving names that drew on the idioms and images of classical Persian poetry for the different varieties of muslin: abrawan (flowing water); shabnam (evening dew); tanzeb (ornament of the body); nayansukh (pleasing to the eye); and more. Although Bengal was ruled by Muslims from the 13th century onwards, it was Emperor Akbar’s general Islam Khan who re-cast Dhaka as Bengal’s capital, giving it distinct Mughal contours. It was during Akbar’s half century of reign in the late 16th century that mulmul khas (“special clothing,” or muslin diaphanously fine) began to be made exclusively for the emperor and the imperial household. It was Akbar again who deemed muslin suitable for India’s summers and who designed the Mughal jama, men’s outerwear with fitted top and a pleated skirt falling to below the knees. There are many stories about the translucent quality of the mulmul khas. One of the most enduring is that of Emperor Aurangzeb chiding his daughter princess Zeb-un-Nisa, a poet well-versed in astronomy, mathematics and Islamic theology, for appearing in transparent dress in court. She replied, to the astonishment of her father, that her dress, in fact, consisted of seven separate layers of muslin. A handloom rested on the floor at the exhibition, the kind that once wove muslin. It was the Indian pit treadle loom, one that has remained relatively unchanged over roughly 4,000 years. It was a thing of bamboo and rope, at which the weaver sat with his feet in a pit dug below to operate the treadles. I walked around it, looking at it from all sides, baffled that this rudimentary construction had snared whole empires in its almost invisible threads. Although muslin weaving is nearly non-existent today, pit-loom workshops such as this one in Sonargaon, near Dhaka, continue to produce jamdani saris, which most likely take their name from Persian words meaning a vase of flowers. Delicate yet far less fine than true muslin, jamdani is made by weavers who have kept alive the tradition of fine weaving in Bangladesh. Weaving is as old as Bengal, conspicuously present in its oldest literature. In the Charyapadas of the 10th century, written on palm leaves in the oldest form of the Bengali language yet known, the loom, yarn and weaving represent mystical concepts. Weavers populate the mangalkavyas written by medieval Bengali poets; they are also present in older ballads, chants and songs as well as depicted in terra-cotta. On the museum walls were photos of weavers and spinners, the women and men behind the magic fabric. 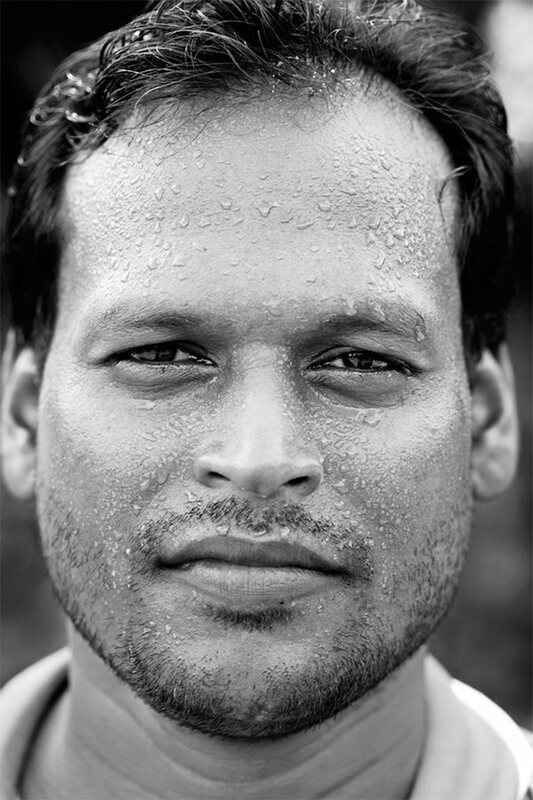 Faces of rural Bengal—sunburnt, lean, teeth stained with paan, stoic. It was impossibly backbreaking, mind-numbing labor, supported fore and aft by large groups of farmers, washers, cleaners, dyers, sewers, embroiderers and balers, all organized, in typically Indian fashion, by religion and caste. On view in February at the Bangladesh National Museum in Dhaka, the exhibition “Muslin Revival” drew more than 10,000 visitors a day, setting a record for the most-visited exhibit to date. But muslin’s days were numbered. The British colonial apparatus, whether in the form of the East India Company or as direct rule by the Crown, was a vast extractive machine. So too had been the Mughal state, which had herded the weavers into designated workshops called kothis to labor in harsh, even punitive, conditions. But compared to the pitiless operations of the British, the Mughals were models of mercy. On one side, both Company and Crown squeezed the farmers and the weavers until nothing was left, then squeezed some more. On the other, a factory-produced, mass-product “muslin” rolled off the newly invented power looms in Lancashire cotton mills. Aided by a raft of tariffs, duties and taxes, British cotton textiles flooded not only the European markets, but the Indian ones as well, bringing Bengal’s handloom cotton industry, and muslin, to its knees. Along the riverbanks, phuti karpas became extinct. Famines swept through the previously fertile land of Bengal, and spinners and weavers changed occupations, fled from their villages or starved. Only jamdani, known as “figured muslin” due to the flower and abstract motifs woven on it, survived to the present times. 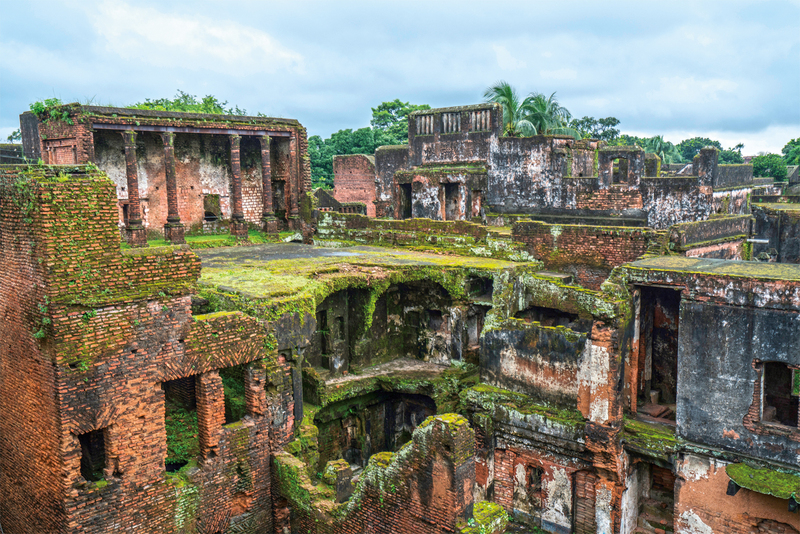 In the Bangla language, a place where muslin was made and sold was called arong, and the largest arong was at Panam Nagar, in Sonargaon, where the East India Company factory was located. It now stands as a reminder of how what was once the cloth of emperors was felled by an industrializing, colonial economy. The muslin festival culminated an arduous two-year effort by a small research team affiliated with Drik Picture Library, a Dhaka nonprofit that began in the 1990s and has since evolved into a cultural institution aiming to change representations of Bangladesh. At Drik’s offices, where youthful energy and defiant political posters underline a buoyant commitment to social issues, I talked with Saiful Islam, its ceo and author of the exhibition’s book Muslin: Our Story (and, I should add, my younger brother). He and his team pursued cotton species and fabrics; sought out vanishing communities of handloom weavers and spinners; and interviewed historians and fashion designers on three continents as well across the length and breadth of Bangladesh. 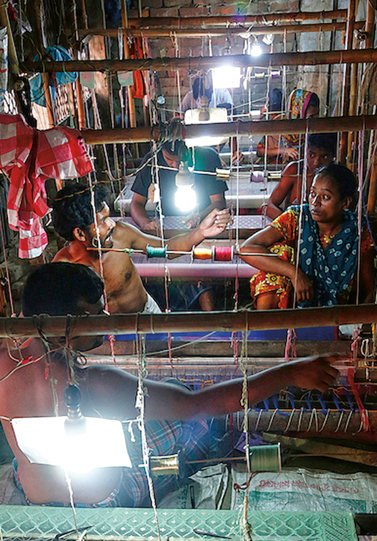 Dhaka’s muslin awaits the next chapter of its history. So does, I am sure, my father, who died in 1984, but who is no doubt looking down from somewhere up there with considerable interest. 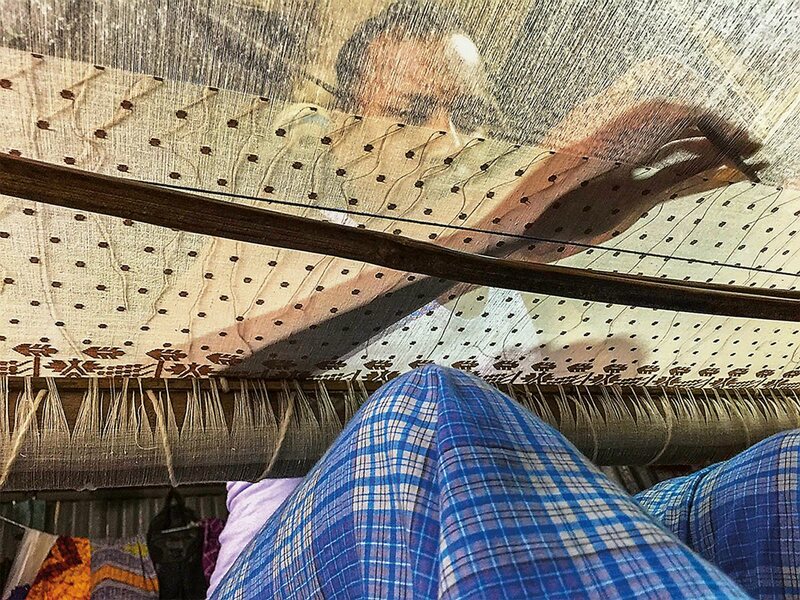 Weaving age-old motifs into a sari of “New Age Muslin,” master weaver Al-Amin received support last year from Drik, the National Museum and the crafts ngo Aarong to begin a revival initiative. Khademul Islam is a writer and translator. He is currently working on a nonfiction book forthcoming from Bloomsbury UK.